My sister gave me two dahlia tubers in March. I left them carelessly banging around the kitchen for a couple of weeks, and noticed they had tiny little sprouts showing. So I planted them in shallow pots. And they are doing great, as you can see. Only problem is, they are frost tender and I dare not plant them out for another month. Case in point: frost is predicted for tonight. So, I’m thinking I need to pot them on, but what size pot should I use? Shallow or deep? And should I pinch the stems? Cold climate gardeners, I need all your dahlia tricks and tips! Dahlias have never done well for me. Yes, they grow. But they usually bloom for the first time about three days before the first frost. Every couple of years I try to find a warmer microclimate than the last place I tried. I’ve never gotten much bloom no matter where they’re planted. So I figured it was time to give them a head start, just like we have to do for all the frost tender vegetables and annuals. But I find I really don’t know dahlia physiology; I don’t know if their roots go deep or wide. So help me out here! My Dahlias in 10 inch pots and are now 2 feet tall in potting soil. I water about 1/2 cup every three days and the leaves are starting to curl. I use bat dropping and worm castings for fertilizer. The curling concerns me. What am I doing wrong? I’ve grown them once here in z5 michigan and they bloomed like bonkers. Got 8 foot tall too. I did not plant them in containers, they went in the ground. I tried saving the tubers but they all rotted, I’ve not yet mastered the art of keeping tender bulbs alive in storage over the winter. Anyways, as I recall, they need to be planted like potatoes, dig a wide deep hole below grade, and then as the plant gets bigger mound up the dirt until it is grade level or a little higher. Full sun and lots of water of course. Mine ended up needing supports. If I ever grow them again I’ll probably get more of the cheap “border dahlias” as they were still gorgeous but of course cheap, and stayed a more manageable size. I think your inadvertent headstart was a good idea. Definitely a gallon or bigger pot comes next, and pinch out the growing tip when there are three sets of leaves below that (usually the plant is a foot or a foot and a half then). The other thing is to insert the support stake right when you plant them out, or (oops!) squish goes the tuber if you do it later on and miss the mark. I would suggest at least a one gallon pot for the dahlias. The garden centers start them pretty early for summer blooming so you are ahead of the curve this year. I have the same problem with Dahlias – they put out their first blooms just before a killing frost hits. I’ve only grown them once in pots and pinched them back occasionally. Hopefully, you’ll miss getting any frost. Well, lucky you! I actually potted up Dahlias in 2qt. containers and have been waiting for them to sprout. I haven’t even potted the ones I gave you. I know that Dahlias love heat and food. It has never dawned on me to fertilize something before, but I might try it. I made a note to myself last year to plant them in pots this year, because they didn’t do so great last year. Different Dahlia varieties bloom early or late – I seek out early and prolific ones, now. 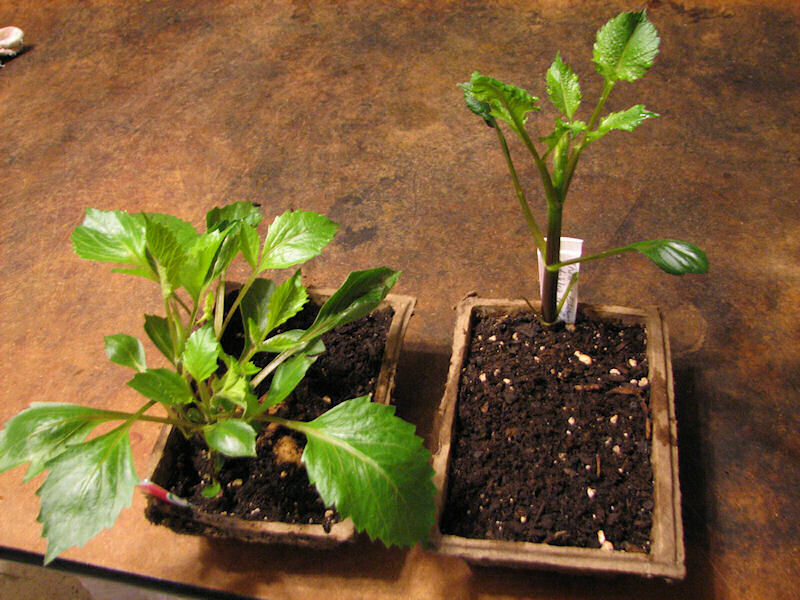 Some people plant early in the ground and claim that they will quickly rebound if a frost nips the foliage. I am not so trusting, and have my big pots of dahlias and other anonymous saved tubers from last year waiting by the door to be brought in. I was just waiting for my husband to be distracted. He is not a big fan of dirt in the kitchen, for some reason. I’m no Dahlia expert, but I have grown them in large planters. I think the deeper the container the better, although a wide contianer might also work, but I’d be concerned about uprooting. I’ve been living dangerously with my new Dahlia. It has been spending its days & above freezing nights outside. I planted it in a large patio container last week. Last night I quickly yanked it out & I’m going to stuff it back in today. (The forecast low for tonight is 37.) I’ll probably end up pinching it a bit late in June or early July. Good luck! I’m not sure either … I also think a deep pot but you are right that it’s much too early to think about planting them (I live in MA). We have enjoyed two weeks of high 60s to mid 70s but now we are cold and chancing frost! Did you have them in full sun inside? And those blooms happened in just six weeks? Great job! I love to look at dahila’s but avoid growing them because of all the fuss and they don’t grow well here in my garden either. I have read that you need a deep pot if you grow them in containers somewhere around 12″ to 14″. I’m no expert at dahila’s though, sorry I’m can’t help too much.